The chance for neoconservative activists to "animate" the true believers came with Israel's deadly flotilla raid on May 31, and they certainly ran with it. "We Con The World," that satire video suggesting that the real mission of those on board the Mavi Marmara was to aid terror, was produced by Latma, a media site run by Caroline Glick, an editor at the Jerusalem Post. But it's her other title that's more relevant here: Senior Fellow for Middle East Affairs at the Center for Security Policy. Glick launched Latma through the CSP, which she says fully funds its operations. CSP is the think tank founded by Frank Gaffney, who was also a founding member of the effort known as the Project for the New American Century. PNAC, in a letter to President Clinton in 1998, called for the removal of Saddam Hussein. Gaffney is one of the dozen or so members of what Janine calls in her book Shadow Elite the "Neocon core," the players who successfully pressed for the war in Iraq. 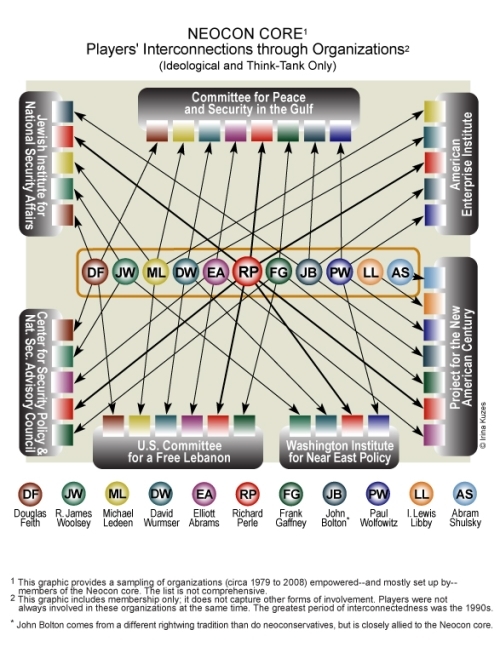 Neocon core members are longtime ideological allies who used their interlocking relationships (see the chart below) across government, think tanks, media, businesses and borders to push forward their vision of asserting American power, and firepower, to remake the Middle East. And enmeshed with this worldview is an investment in defending Israel. One might hope that the Neocon core has been chastened into silence or at least circumspection by the various failures of their grand vision for Iraq, what some critics have called "foreign policy malpractice." And agitate they have in the past 10 days, defending the Likud-led Israeli government, blasting the White House and Turkey, and warning about Iran. Here's a quick round-up of what some core members and groups that played key roles in the Iraq war push have been saying. Frank Gaffney at CSP, a protégé of Richard Perle, linchpin of the Neocon core, argues that the international community has a double-standard: criticizing Israel while ignoring North Korea's torpedoing of a South Korean naval vessel. Another core member and Perle protégé Elliott Abrams - deputy national security advisor handling Middle East affairs under George W. Bush (and signatory of the 1998 PNAC letter), has similar criticism in a commentary called "Joining the Jackals": "The White House did not wish to stand with Israel against this [U.N. Security Council] mob ...because it does not have a policy of solidarity with Israel." Yet another core member and Perle protégé Michael Ledeen, who has long been warning of the threat of Iran and agitated for "regime change" there, considers "the possibility that the Iranians have urged" Turkey to attack Israel. Close core ally John Bolton, undersecretary of State for arms control and international security during the Iraq war run-up (and, you guessed it, signatory of the 1998 PNAC letter) slams the Obama White House in a piece titled "Letting Israel Hang." The Jewish Institute for National Security Affairs (JINSA) has its own "jackal" headline, and says the U.S. should "seriously consider suspending military cooperation with Turkey as a prelude to removing it from" NATO. (Listed on their board of advisors: Perle, Bolton, Ledeen, and Woolsey.) The most perplexing (and perhaps misleading?) thing on JINSA, however, appears on quick glance to be from June 2. The statement is called "Israel as a Security Asset to the U.S.", "signed by 60 of our country's most highly decorated military officers." But the newspapers they show ran the ad not in the last 10 days following the flotilla raid, but weeks before - in early May. From the AEI, a key neoconservative and Neocon core-powered think tank, resident scholar Michael Rubin agrees that Turkey's current leadership is not a friend to Israel, and picks up the Iran threat, saying that Israel "...cannot trust the United States to safeguard its security, and that therefore it must take matters into its own hands on any number of issues, not the least of which is Iran's nuclear program." Her platform these days: the advocacy group Keep America Safe, which she founded last fall with help from leading neoconservative William Kristol (still another signer of the 1998 PNAC letter). Here's some of her statement on the Israel raid, which she reiterated last Sunday on ABC's "This Week". President Obama is contributing to the isolation of Israel, and sending a clear signal to the Turkish-Syrian-Iranian axis that their methods for ostracizing Israel will succeed, and will be met by no resistance from America. Cheney's message at Keep America Safe adheres to current neoconservative dogma - pushing a constant state of emergency against the threat of terrorism, linking American interests inextricably to Israel, invoking the Holocaust, emphasizing a belief that America has a unique and indispensable role in the world of nations. And like her fellow traveler Caroline Glick, she is no slouch in the showmanship department. Keep America Safe caused an uproar this spring by targeting unidentified Justice Department lawyers who had previously represented terror detainees - asking in an ad, "who are the al Qaeda Seven?" and "Whose values do they share?" Cheney might have thought this was one of those chances to "animate" supporters, but it seemed to backfire, with even GOP stalwart Ken Starr calling her move "out of bounds" and "very unwise." Cheney and much of the Neocon core also run the risk of backfiring in terms of Israel. Despite JINSA's insistence that Israel is a security asset to the U.S., Anthony Cordesman, a distinguished foreign policy and military expert, last week argued that the U.S. must ask itself whether Israel might now be a "strategic liability." His commentary came out of the centrist Center for Strategic and International Studies. Stephen Walt, well-known for tangling with neocons and the Israel lobby, said last week that it is Israel's most fervent "friends", not President Obama, who are doing damage to their own cause. His message: they need to temper their unquestioned support, or risk letting their "misguided zeal" drive Israel "down the road to further international isolation."